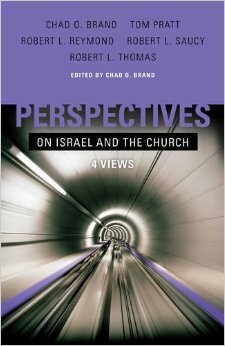 See my post introducing this series that works through B&H’s Perspectives on Israel and the Church: 4 Views. Robert Reymond articulates the Covenant Theology view, holding that God’s eternal covenant of grace results in “one people of God, that is, the church, comprised of all the elect of all ages” (p23). The Abrahamic covenant. “The ‘new covenant’ […] is simply the administrative ‘extension and unfolding of the Abrahamic covenant'” (quoting John Murray). Therefore, “the church of Jesus Christ…not ethnic Israel, is the present-day expression of the one people of God whose roots go back to Abraham” (p40, bold is italicized in original). Paul’s teaching. According to Romans 9-11, “God never promised to save every Israelite; rather, he promised to save the elect (true) ‘Israel’ within the nation of Israel (Rom 9:6)” (p50), and as to ethnic Jewish salvation, they are grafted back in to their olive tree through faith in Jesus in this present age (Rom 11:23-24). The salvation of elect Gentile and Jew together brings about the salvation of “all Israel” (Rom 11:26). Peter’s teaching. Peter affirms Jesus’ replacement theology by applying God’s descriptions of Israel (Ex 19:5-6; Hos 1:6, 9-10) to the church (1 Pe 2:9; 2:10). Given #1 and #2, the land promised in the Old Testament “cannot be regarded as having continuing significance” (p56). This continues with three sub-points and an exegesis of Acts 1:6-7. The OT predictions of a return of Israel to the land “are more properly interpreted as types having consummating fulfillment” in the new creation. Anything else is a “retrogression to the limited forms of the old covenant”; turning back the redemptive clock, so to speak (p60). “The future messianic kingdom will embrace the whole of the newly recreated cosmos” and will not include a distinctly Jewish element or sector “in any sense” (p60). Since “the only hope of salvation for the Jewish people resides in the provisions of the Christian gospel” (p64), Christians should love Jews best by “bring[ing] the Jewish people to the place where they will forsake any and every religious distinctive in which they may be resting their hope for salvation” (p68). Reymond had some good points and his conclusions are articulate and clear, but I will restrict myself to questions and criticisms. I hoped for more exegesis. See the list of arguments in p25-27, which have proof-texts in parentheses. When these texts are examined, it becomes clear that most require unpacking to be used as support. In one instance, Reymond presents his view of Gal 6:12-16, Eph 2:11-13 and Phil 3:3 in a single sentence each, concluding that “clearly, the church of Jesus Christ is the present-day, true Israel of God” (p41). I thought this was the issue needed to be proven! Reymond’s treatment of the parable of the tenants misses the point by blurring the distinction between the tenants (who are rejected) and the vineyard. I am not sure how Reymond’s view of salvation in the OT is inherently incompatible with dispensationalism. I doubt that DTS’s statement speaks for all, contra Reymond’s claims. Even if one grants the land promise is fulfilled in the new creation, I’m not convinced that Reymond rules out all prophecies specific to a national Israel. For example, I find Ezekiel 36-39 and Zech 12-14 difficult to interpret apart from predicting future tribulation and restoration of ethnic, national Israel in some sense. Check back for a summary of the three responses to Reymond’s view. Comments from all viewpoint are welcome! Many thanks to B&H for providing a review copy. What is the Relationship of Israel and the Church?